Growing fruit trees in your home garden ensures you nutrient rich, fresh, organic juicy fruits in the season. You can grow a variety of fruit like tomatoes, avocados, lemons, limes, bananas, papayas, pineapples, guavas, blueberries, strawberries, cherries, etc. at home. If you have enough space in your garden, then why not plant grapefruit, lychees, mangoes, mulberries, etc. This page is your guide to all the fruit growing information on the site. Tips for growing fruit trees in pots (how to grow fruit trees in pots) and garden beds starting from seeds, seedlings and cuttings are explained in individual fruit articles. Most fruit trees need lot of garden space because they send their roots to a larger space. Such trees, are for example, mango, lychee, mulberry, guava, etc. But there are some trees that need small space like blueberry, strawberry, lime, lemon, banana, etc. 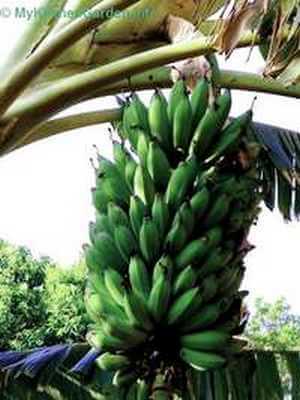 Many fruits can be grown in pots. In modern days, dwarf varieties of fruit trees have been developed, so they can be grown in pots with a good produce of fruits. The dwraf fruit trees are suitable for smaller backyards and also to limit the height of the trees in order to make it easier when picking, pruning, netting etc. Yet another varieties of fruit trees are grafted trees which can produce more than one variety on the same tree, such as lemon, lime, mandarin and orang on the same tree. 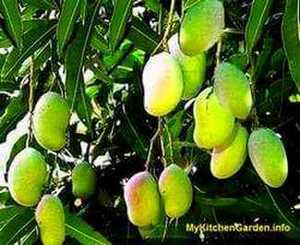 The fruit trees generally grow very tall with large canopies like mango and lychee, while lemon, lime, banana, blueberry, strawberry are slmall trees or shrubs which can be grown in large containers. Most fruit trees grow in sun, about 6-8 hours of sun light daily; the sun gives the needed energy to build fruits. Most fruit plants need a high draining rich soil to produce fruits. Some fruits grow in soil having neutral soil, while some need low pH and others love high pH soil. However, most fruit trees can survive in a variety of soils. You can adjust the soil pH by adding lime to increase alkalinity or sulphur to raise the acidity. (Best Fruit Trees to grow in Pots).